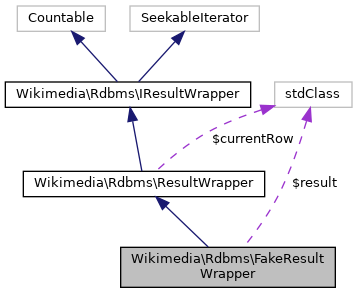 Overloads the relevant methods of the real ResultsWrapper so it doesn't go anywhere near an actual database. Definition at line 11 of file FakeResultWrapper.php. Definition at line 17 of file FakeResultWrapper.php. Definition at line 46 of file FakeResultWrapper.php. Definition at line 25 of file FakeResultWrapper.php. This either saves memory in PHP (buffered queries) or on the server (unbuffered queries). In general, queries are not large enough in result sets for this to be worth calling. Definition at line 43 of file FakeResultWrapper.php. 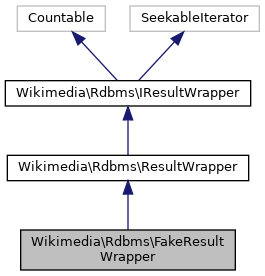 Definition at line 60 of file FakeResultWrapper.php. Definition at line 21 of file FakeResultWrapper.php. Definition at line 55 of file FakeResultWrapper.php. Definition at line 39 of file FakeResultWrapper.php.